A diverticulum is a sac or pocket that forms on a portion of the body. A Zenker’s diverticulum is a pouch that develops on the pharynx, in the upper esophagus of the neck. It may trap food, causing difficulty or pain when swallowing. Other side effects include bad breath, regurgitation, coughing, unexplained weight loss, irritation of the throat and aspiration (the passage of food or liquid into the lungs). Zenker’s diverticulum is the most common type of esophageal diverticulum. The most common cause of Zenker’s diverticulum is increased muscle pressure in the upper esophagus or pharynx. This extra pressure causes a pouch to form in the muscle. 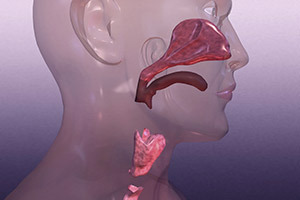 It may be attributed to loss of elasticity or atrophy of the muscle, abnormal timing of the muscle while swallowing, a central nervous system disorder, gastroesophageal reflux disease (GERD) or an abnormality in the upper esophageal sphincter. Zenker’s diverticulum is more common in men than women, and largely confined to older adults over the age of 50. To diagnose Zenker’s diverticulum, patients are usually given a barium swallow. This coats the esophagus and enables it to stand out in contrast on an X-ray. Alternatively, endoscopy or esophageal manometry may be performed. Treatment depends on the size of the pouch. Smaller diverticula can often be ignored, so long as they do not cause swallowing problems (dysphagia). Unfortunately, over time swallowing difficulty is likely to increase, leading to the eventual need for treatment. Surgery is the usual treatment method, as no medications currently exist for Zenker’s diverticulum. There are two main types of surgical repair: open and transoral (endocopic). In open surgery, an incision is made in the neck and the diverticulum is either removed or tacked upside down so it is unable to fill and cause problems. The patient is usually required to stay in the hospital for a day or two. In the transoral or endoscopic procedure, a GI stapler is inserted through the mouth using a bivalve (two-blade) endoscope, and the muscle between the pouch and esophagus is cut. No incision is needed, and patients can usually go home the same day.